One of my all time favourite dishes.. Yes this one!!! Give it to me cooked by my mum.. anywhere .. anytime of the day..any number of times….Everytime, I love love love it. Have it with paranthas, rice, naan , or my favourite tandoori roti.. add some onions, chillies, mango pickel, papads (poppadoms) to go with it and you are in heaven!!! 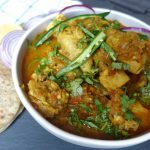 !If you like chicken and want to have some authentic, rustic, flavourful .. home cooked style.. something that tastes light and fresh.. you should try this recipe.This one is my mothers recipe , passed on to her by my grandma and one of the favourite dishes in our family.Friends or family.. whosoever has tasted it.. has loved it.. I haven’t made any changes to the recipe, as I like it the way it is. You can try and adjust the spices as per your taste.It is best cooked with skinless whole chicken , cleaned and cut into small pieces, and using authentic Indian spices.I added enough water to make good amount of gravy as my husband likes gravy, but I feel it tastes as great ,if you add lesser water and then saute it nicely for some time on high heat.I cook both the versions, depending, for whom this is being cooked. It needs a good amount of onions and garlic to get that perfect flavour. Also I use MDH Chicken curry powder, I have tried others but this one tastes best.In India you get loads of versions of chicken curry powder, but here in UK it is difficult to find many. MDH Chicken curry powder can be bought from any of the Asian stores. 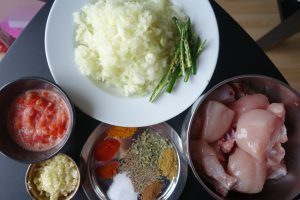 If you have homemade chicken curry powder, that is the best option and you can use that.I haven’t tried making the chicken curry powder at home , but am intending to.. soon.. and will let you know when I do.For now , have to make do with the store bought ones. So what are we waiting for folks.. get your ingredients ready and start working with your kitchen gadgets….Lets get started!! 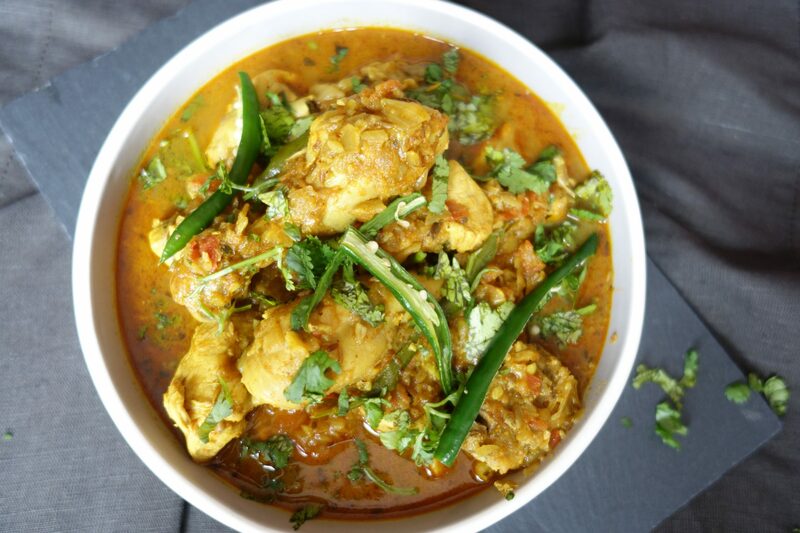 A rustic Indian chicken curry cooked in flavourful Indian spices. Make puree of roughly chopped tomato and garlic cloves, and keep aside. This will be used later in the recipe. In a pan / Kadai heat oil. If you are using mustard oil ,heat it till it reaches the smoking point.If using ghee or any other cooking oil heat it as you would regularly do. Add chopped onions, and saute them nicely till they are light brown. If using ginger, add it at this point and sauté till the raw ginger aroma goes away. Add degi mirch powder , mix it well with the onions and ginger. Add chicken pieces and mix onions and chicken well. Add salt, red chilli powder and turmeric powder. Cook for 8-10 min till the chicken turns white and is partially cooked. Now add the tomato and garlic puree.Mix it well. Add Chicken masala powder.Add water. Cover it and let it simmer for 10 min. 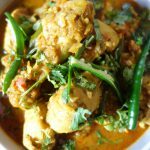 Once chicken is cooked and you have the desired consistency for the gravy, add the crushed dried fenugreek leaves and mix them well. Garnish it will coriander and slit chillies.Serve hot with Roti's or paranthas. Hey Anu.. thanks for sharing this recipe.. I am going to try this recipe and will share my feedback soon.. one request ,can you please share some recipes for kid’s lunch packs? Hey Shalu.. How r u? Will await your feedback.Yes will surely share some kids lunch recipes soon.